The first Cup Final played in the East this Sunday the Hertfordshire Women’s County Cup at The County Ground, Letchworth. 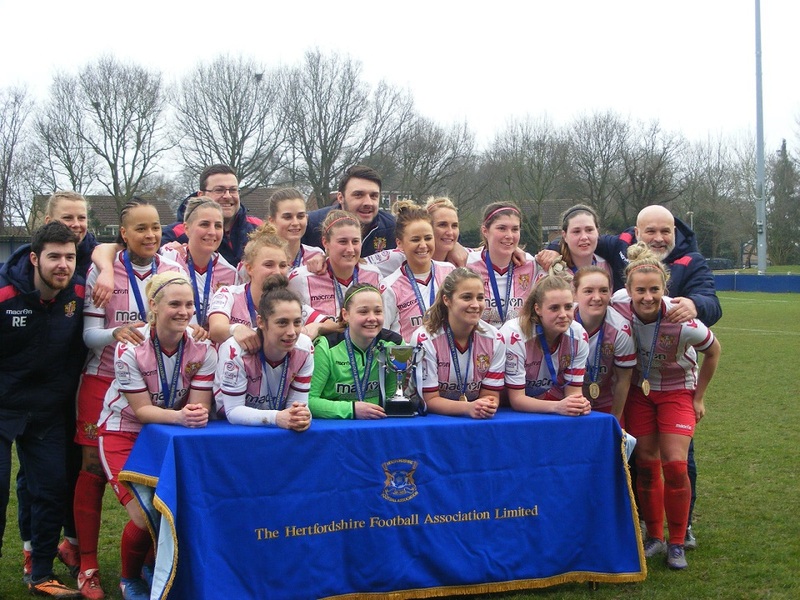 Women’s Football East was there too to watch Stevenage Ladies the current holders playing in their 4th successive county cup final looking to retain the trophy for the first time up against Hoddesdon Town Owls Ladies who had reached the final of the competition for the 1st time. Two leagues between the sides Stevenage Ladies playing in the FAWPL South East Division One starting the game well and opened the scoring in the 16th minute Amy Makewell sending a low drive from outside the box into the bottom corner of the net. Found nearly the same spot again soon after to make it 2-0 before midfielder Chloe Gunn broke forwards to make it 3-0 then added another herself from a well taken free-kick 25 yards from goal. Introduced late in the 1st half substitute Ashleigh Deacon scored a quickfire brace to extend Stevenage’s lead before Makewell when on to complete her hat-trick. Leah Littlechild receiving the ball from Nicole Emmings to score Stevenage’s 8th goal to successfully retain the County Cup for the 1st time. The first of the semi-final of this years Beds & Herts Women’s League Cup took place this Sunday with St Albans Ladies leading Division one at home to fellow league side Sharnbrook WFC. A great start for the hosts going 2-0 up inside the opening 15 minutes with Michaela Johnson and Katie Grehan on target. Sharnbrook pulling a goal back, St Albans extending their lead on the half hour with a goal from Sophie Lawrence. Their lead at half-time 4-1 with Nicola Dark scoring late in the 1st half. Sharnbrook getting it back to 4-2 early in the 2nd half. Eleanor Lovelock restoring St Albans 3 goal lead in the 57th minute. Into the final 10 minutes Ellen Slater running through to score St Albans 6th goal. Sharnbrook adding another goal at the death, time for St Albans to reply, Grehan with her 2nd of the game in stoppage time. 7-3 the final score as St Albans celebrate reaching this season’s League Cup Final the double on! Houghton Athletic Ladies the current holders of the Beds & Herts Women’s League Cup meet Northwood Ladies at home this coming Sunday in the 2nd semi-final. Two matches in Beds & Herts Women’s Division One this Sunday. 3rd placed Sherrardswood Ladies close the gap to 2nd placed Northwood Ladies to just 2 points still with 2 games in hand as they secured all 3 points at home to Garston Ladies this Sunday. Goals in the 2nd half from Laurie Marris and Laura Cousins securing a 2-1 victory for the hosts. Houghton Athletic Ladies move up from 6th to 4th in the Beds & Herts Women’s Division One table with a 2-1 home win against Flitwick Ladies on Sunday. Scoring all 3 of the goals in the match and own goal cancelled out with goals for Shakeela Hussain and Eireann O’Donoghue her 1st goal for Houghton Athletic. One match played in Beds & Herts Women’s Division Two this Sunday. Leaders Garston Ladies 2nd XI were at home taking on Evergreen Eagles. Top scorer Lauren Berryman moved onto 21 goals for the season as she netted a brace in the match with Maxine Hotz also finding the back of the net in a 3-1 victory to move Garston into a 5 point lead at the top of the table. Amber Charlton scoring the goal for Evergreen Eagles. One match also in Beds & Herts Women’s Division Three with Evergreen Ladies at home to Woburn & Wavendon Lionesses Clarets. Both sides level on points on 13 in 5th and 4th respectfully going into the match. A brace from Natalie Maher enough to secure all 3 points for Evergreen Ladies in a 2-1 win that takes them 3 points clear into 4th spot in the table. This entry was posted in Beds & Herts Women's Division One, Beds & Herts Women's Division Three, Beds & Herts Women's Division Two, Beds & Herts Women's League Cup, Hertfordshire Women's County Cup, The Round-Up and tagged Beds & Herts Women's Division One, Beds & Herts Women's Division Three, Beds & Herts Women's Division Two, Beds & Herts Women's League Cup, Hertfordshire Women's County Cup, The Round-Up on March 14, 2018 by WFEast.